A return to Hamburg for Nick, and a hugely appreciative audience. For this latest show on the tour, during his initial thanks and welcome to the audience, Nick said: "Good evening everyone and welcome. I'm Nick Mason and we are NOT the Australian Roger Waters, or indeed the Danish David Gilmours, or anything else; we are Nick Mason's Saucerful Of Secrets. I don't know if there's anyone here tonight who remembers when I was last here. I certainly DON'T but have it on good authority that I was here in 1971. Anyone else? [Lots of cheers] You can't ALL be over 70!! Anyway, we're very pleased to be here, and hope you enjoy yourselves as much as we are, up here." 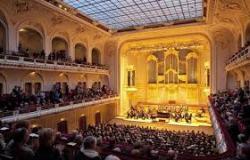 Tomorrow is a rest day, then the following night, they play the Beethovensaal in Stuttgart.